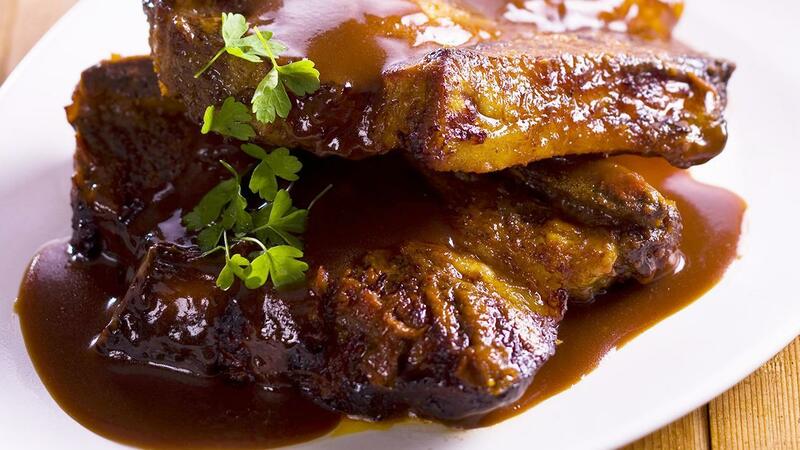 There is nothing better to eat with your hands than tender sticky ribs. Combining the chilli jam and chipotle ensures you get that sticky texture every time. Preheat the char grill and grill the ribs until browned. Place into a large baking tray and add the water and KNORR Italiana Napolitana Sauce GF. Cover and place into a preheated oven (180 degree Celsius) and cook for one and half hours. Remove from the oven and drain off the liquid. Place the bourbon into a large pot bring to the boil and reduce by half. Add the hot water and whisk in the KNORR Rich Brown Gravy and bring to the boil while continuously stirring. Reduce the heat and add the KNORR American Chipotle BBQ Sauce GF and cook for a further 2 minutes. Pour the sauce over the ribs and place back in the oven for a further 15 minutes. Remove and serve with thick cut chips.